Location: The Preserve’s address is 1800 Lola Road, Smithland, KY. The Preserve is 2 miles west of Joy, KY on KY Hwy 133. Directions from Smithland Follow US-60 E for 8.6 mi / Turn left onto KY-135 N and travel 8.2 mi / Turn left onto KY-133 N and travel 2.1 mi / Turn left onto Mantle Rock Rd. Trailhead: Follow the signs to preserve parking after turning on Mantle Rock Road. Trail Description: The Preserve consists of 367 acres. Notably, the centerpiece is a 30-foot high natural sandstone bridge. 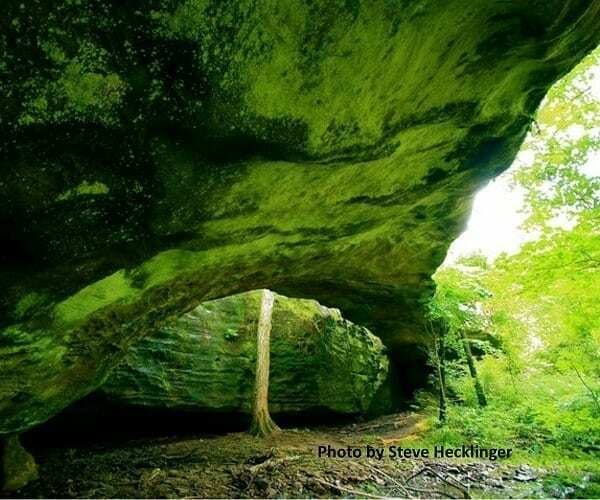 This rock formation is the largest freestanding arch east of the Mississippi River. Trail Description: The hiking trail is a 2.75 mile loop trail. The trail extends around the interior of the wooded nature preserve. 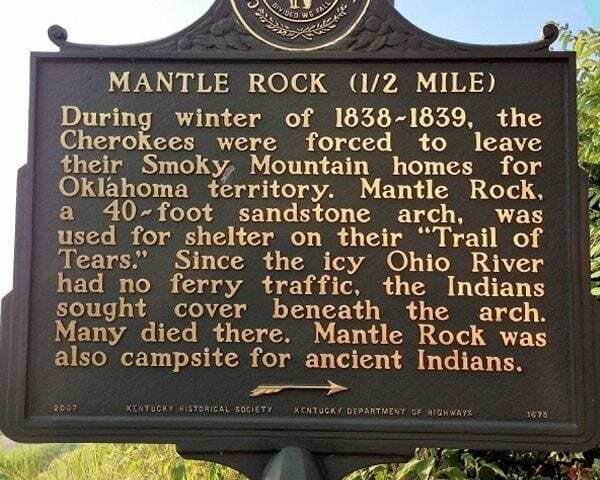 If you hike the loop you will hike a portion of the Trail of Tears National Historic Trail. If you want a shorter hike and only want to see the rock, veer to the left when you begin the loop (See the map) and you can go out to the rock and back. IMPORTANT NOTE: The hunting rights on a portion of the Mantle Rock Preserve are owned by a third party; therefore, hunting is not managed by The Nature Conservancy. All visitors should be familiar with hunting season dates in this areas by consulting the Kentucky Department of Fish & Wildlife Resources (800-858-1549).